With more than 5,000,000 print copies in circulation, The Open Bible Study Notes is the most recognized name in study Bibles. For over 20 years these accessible study Bible notes have helped readers explore the Scriptures with tons of great information and study helps. The study Bible notes that gets you quickly and fully into the Word. Find what you need! The Open Bible Study Notes are designed for the hungry reader. These study Bible notes are filled with amazing study aids including comprehensive book introductions and outlines, Read-Along references and translation notes, and the classic Biblical Cyclopedic Index covering more than 8,000 textual entries. 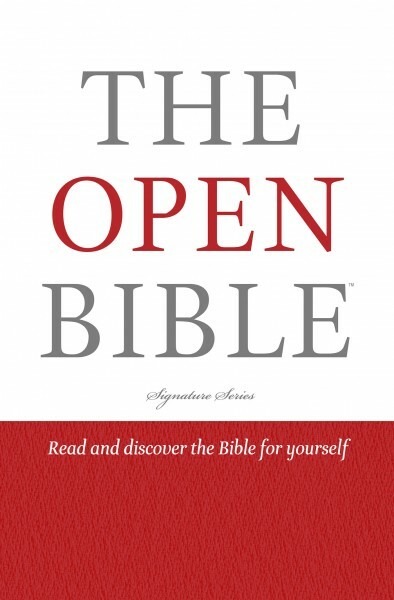 The Open Bible Study Notes also feature a seven-step method on How to Study the Bible, a Visual Survey of the Bible, The Christian's Guide to the New Life, and The Greatest Archaeological Discoveries of the Bible.